Summer is right around the corner and Spring Break for some is already here. While you might be busting your buns to get that beach body you could be doing more harm than good. Recovery is just as important as pushing yourself to see results. Runners, crossfitters, lifters and athletes of all types swear by it and here are some beginner movements that’ll help with recovery. Mensfitness.com put together 10 easy to learn recovery movements. 1.) Upper Body, 30 seconds or more depending on discomfort. Lie on your back. Place the roller under your upper back. Raise your hips and use your legs to roll forward and backward slowly. 2.) Calf Roll, Sit on the floor with your legs stretched in front. Place the roller under one leg with your other leg supporting some of your weight. Your hands should be behind you or at your sides. Now raise your hips and roll forward. You should feel this working the calf. Switch legs. 4.) IT Band Roll, this one feels like a dream. For runners and squat enthusiast, a tight IT Band can wreck a workout. Lie on your side, similar to a side plank. Place as much weight onto the bottom leg and roll forward and back. Repeat and enjoy. 5.) 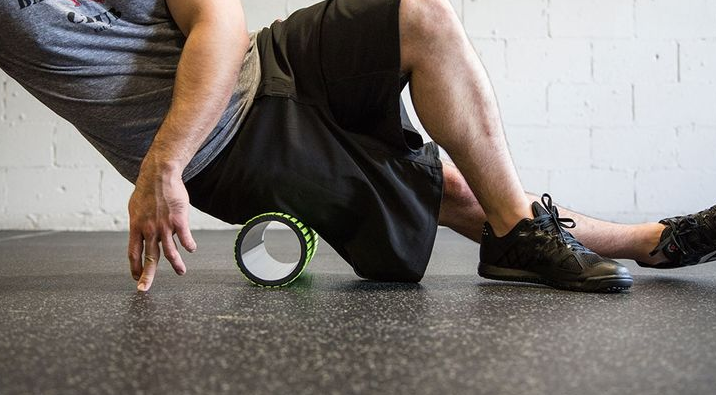 Hamstrings Roll, sit with your legs straight out with the roller under your upper legs. Use your hands, either at your side or behind you, to help support your weight. Relax your hammies and lift your hips up and roll forward and back slowly. 6.) Quads Roll, Easy explanation, get in the down push up position. Roller should be underneath one leg with that foot on the ground. Now shift your weight and roll from hip to above the knee. Do this for each side. 7.) Lats Roll, MensFitness.com explains it best, “While lying on the floor, place a foam roller under your back and to one side, just under your armpit.” Shift your weight onto your lats, keeping your upper body off of the ground. 8.) Glutes (Booty) Roll. This one will help if sciatic nerve pain.Sit on your roller and cross your ankle over your knee. Shift your weight and roll. Balance and relaxation is key. 9.) Lower back roll. Lots of people complain of lower back pain and this is surely to help ease it. Get in the sit up position. Shoot your hips up and place the roller under your lower back. Now roll back and forth with your weight on the lower back and not the spine. 10.) Chest roll. Back to pushup position with the roller at your chest. Slow and control is key when you roll forward. Some runners have tightness in their chest and upper shoulders because the hunch while they run. This is designed to relieve that tension.